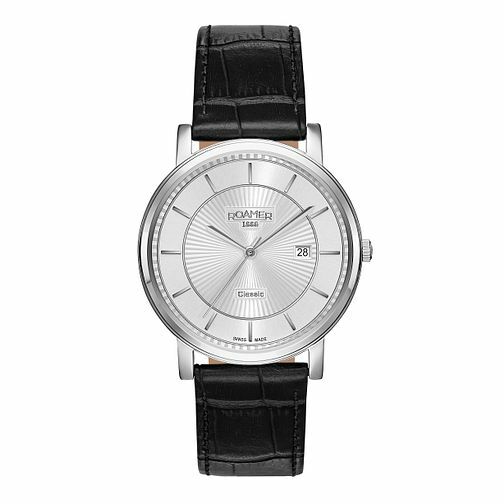 A sleek and contemporary men's quartz timepiece from high quality Swiss watchmakers Roamer's Classic Line range. Featuring a black leather strap, the silver dial is simply finished with matching hour markers and a handy date window. Roamer Classic Line Men's Leather Strap Watch is rated 5.0 out of 5 by 1. Rated 5 out of 5 by Anonymous from Beautiful, Classic Design A Perfect retirement gift with classic clean lines and slightly smaller than many men's watches. Beautifully gift wrapped and quick delivery.